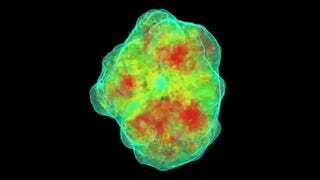 NASA has created the first ever map of radioactive material in a supernova remnant, revealing one of the biggest mysteries in the universe: How stars blow up in these explosions, sowing the universe with heavy elements like iron, titanium or gold. The 3D simulation above shows the explosion process in Cassiopeia A, rendered from data recorded by the Nuclear Spectroscopic Telescope Array (NuSTAR). Stars are spherical balls of gas, and so you might think that when they end their lives and explode, that explosion would look like a uniform ball expanding out with great power. Our new results show how the explosion's heart, or engine, is distorted, possibly because the inner regions literally slosh around before detonating. Here's an actual image of Cassiopeia A.